The Mass Ave series continues today with insight on the blocks between East and College -one of the most walkable corridors in the city. This particular stretch of Mass has become a vibrant commercial node serving the Chatham Arch neighborhood, the aorta of Indy’s LGBT community, and a considerable contributor to Indy’s local theater scene. Here follows a brief discussion of significant developments that will supplement one of Indy’s true urban hamlets. Mass between East St. and Walnut/Park. 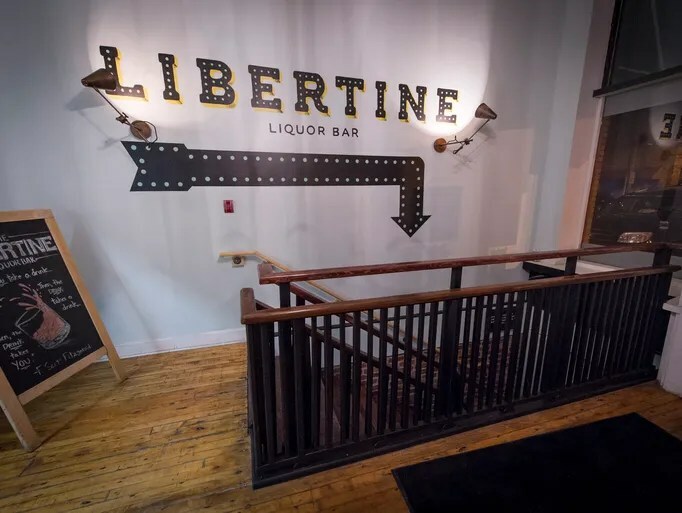 The Libertine Liquor Bar – 608 Massachusetts Ave – Owned by Neal Brown (arguably the greatest chef in the Great Lakes region), one of the best bars in the country according to Esquire, a favorite of Katy Perry’s, and now, a resident of Mass Ave. Formerly located on E Washington St, Brown moved The Libertine for the late night foot traffic generated on Mass Ave and, if there was some before, there’s going to be more now. This is a huge win for this stretch of block and a particularly neat location, considering the bar is now in the basement of Pizzology. 2. Millennium on Park – Proposed mixed-use infill coming to block surrounded by N Park Ave, E North St and Leon. Squeezed right between Chatham Arch and historic Lockerbie, this project has found one of the best locations downtown in terms of real estate. It’s fantastic to see infill downtown rising to more than 4-5 stories. If the project is built as proposed, it will aid the developments already underway in creating a massive influx of residents to the Mass Ave area, further bolstering street vibrancy. With added density and increased pedestrian activity, it’d be fantastic to see Mass Ave make the leap from solely local businesses/boutiques to a business district with a wide-array of commercial properties. Hopefully, the design is improved…but you gotta love that density! Obviously, most critical here is the development of the Firefighters Credit Union, Museum and parking lot on St. Clair -all of which permits the land swap that allows Montage on Mass to be built a couple blocks south. 1. and 2. Fire Credit Union & ****ing parking lot – The $5 million project migrates the Firefighters Credit Union from its current location at 501 North New Jersey Street, where Montage is to be constructed, to the north end of Mass Ave. A new credit union would be constructed next to the IFD Museum and union hall located at 748 Massachusetts Ave. As part of the project, the union hall will be expanded 40 feet to allow for more offices. Okay, let’s just discuss the few positives here: the contribution to the Mass Ave street wall by the Credit Union/Union Hall is decent and the public plaza on the corner is okay only because it’s better than what was already there. That’s about where the positives end. Although the buildings may aesthetically look “nice” if you ascribe to mediocrity, even their assistance in street wall creation is mitigated by the fact their uses totally DO NOT activate the streetscape or engage pedestrians. Yeah, the little plaza is cool but really, they occupied a delicious, prime corner spot (on perhaps Indy’s most urban street, at one of its major intersections) that possessed glorious potential. The intersection of Mass/College is downtown’s door (I enjoy alliteration) for those traveling south on College and this is what we get, Indianapolis? I was already sick of seeing IPS driving in, but there was hope we would get something other than potential wasted on asphalt – a golden opportunity which was not only wasted, but an opportunity that spoiled and then was force-fed to the populace. Just cover it with some art -what a slap! A surface parking lot, what an entrance! Oh! A trifle plaza that feels more like concession than intention to create public space – a public space that could have been capital, activating streetscape. 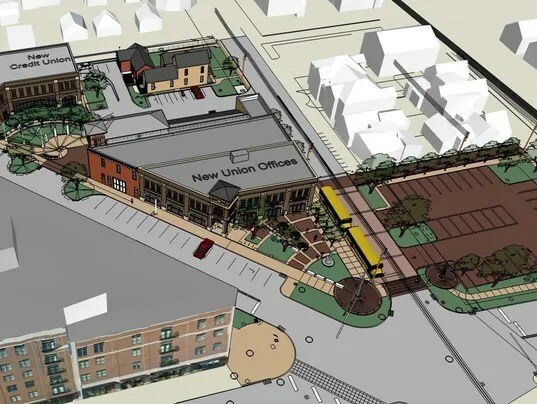 It seems that with a small amount of creativity, planners could have combined both these facilities into one building on the plot of the parking lot – a parking garage in back and underneath a certain portion would be a drive-through for the credit union. Instead of the land actually being used, developing the lot on St. Clair could have relinquished the ripe, luscious Mass Ave-facing property for private commercial uses. But that would have required too much thought. Or money. But damn, think of the future property taxes that would have been generated for the city by a mixed-use development built adjacent to (and perhaps branded with) the old fire station. I can imagine a cool mixed-user named The Station or something. Maybe that would have made up for the investment. At least the option should have been frickin’ explored. Goodness gracious. Alright, I’m calming down. Anyways. Tomorrow, we will be discussing the beautiful Mass Ave from College to 10th St.. Feel free to comment, as always! On another note, since you mentioned Mass Ave/Chatham Arch being the main LGBT neighborhood of Indy. I’m gay and spend a lot of time in Mass Ave. and I have always thought how great it would be if Indy made Mass Ave an official ‘gayborhood.’ One popular concept I have seen other cities doing is painting a rainbow on a cross walk on one of the major intersections in the neighborhood. For Chatham Arch I would say Mass Ave & Park Ave would be the best candidate. Another option would be to simply add some rainbow flags or banners throughout the avenue. With everything that happened with the RFA this summer, Indiana could really benefit from this. With that being said, I am sure most residents and business owners in the neighborhood would welcome the idea and probably even pitch in for funding. mass ave might’ve started out as a gayborhood but it’s majority hipsters now but still with a high percentage of gays, I’d think you’d have more luck gentrifying/gayborhooding another area, like fountain square or east of there. Just seems too late in the game to rainbow mass ave..
i like the increase in density but why can’t indianapolis produce something that’s actually modern/interesting….